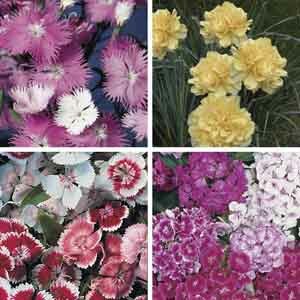 Dianthus have been a standard for flower gardens for generations. The delicate frilly flowers and soft gray foliage are a welcome sight in the spring garden. Many types have a wonderful spicy fragrance and all types attract butterflies. Easy to grow in a container or in the garden. Faded flowers should be removed to encourage additional blooming. Ideal choice for beds, borders, and cutting gardens. Cut flowers are long-lasting in fresh bouquets. Smaller types are perfectly sized for rock gardens and border fronts. Charming when tucked into rock crevices or walls. Perfect for all kinds of containers. Best in well-drained, lime-enriched soil. Allow soil to dry between thorough waterings. Remove faded flowers for best display. Protect from excessive winter moisture.